Have you ever “smelled” a country? TCKs can (Third Culture Kids). They’ve lived in so many places, smelled so many different smells, heard so many different sounds, been in so many different situations, that they experience the world in many different dimensions. Becky can easily and fearlessly walk into most any situation in Ethiopia with absolute poise and equanimity. Crossing cultures is no big deal for her. Never has been. It was like that when I took her to live in Switzerland too. I believe I’m the same way, though I’m not sure why (I’m no TCK). Perhaps it was because I grew up in a transient society like Hawaii (people were always arriving and then, before you knew it, they were leaving again). It may be due to the ethnic diversity I enjoyed so much there (and miss so terribly here on the mainland) – with Japanese and Philippinos and Koreans and Chinese and Portuguese and Hawaiians and Blacks and Caucasians all intermingling. I think being an ethnic minority as a child also contributed to my compassion for people of other races (Caucasians were outnumbered by Asians in Hawaii, and still are). Be that as it may, Becky and I think a cross-cultural lifestyle is so normal that we hardly realize just how easy it is for us to minister in Ethiopia. 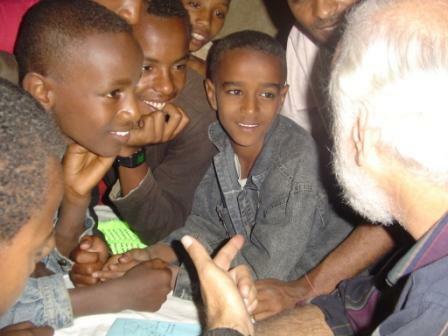 We have a sense of intimacy with our Ethiopian family, a feeling that we fit in. It was like that from day one for Becky, and from about day two for me. I can now smell Ethiopia.